Animal models play an important role to test novel experimental strategies and reconstructive surgical treatments of focal articular cartilage defects. Such animal models need to reflect the different appearances and aetiologies of cartilage defects, e.g. caused by trauma or osteoarthritis. Depth of articular cartilage defects plays an important role. Full-thickness chondral defects do not extend into the subchondral bone, while osteochondral defects penetrate the cement line and extend to the subchondral bone, thereby changing its structural integrity. Mice, rats, rabbits, goat, sheep, minipigs and horses are representing good models, bridging the gap between in vitro studies and clinical experiments in human. Each of them has benefits and limitations. 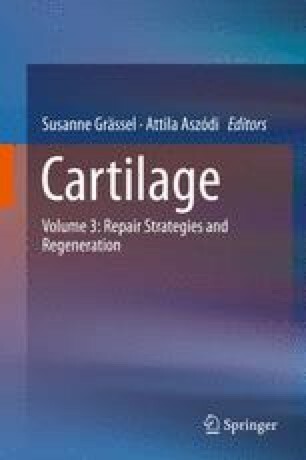 Evaluation of cartilage repair may be performed using a large variety of methods, among which non-destructive evaluations and histological scoring, the latter being considered as the gold standard. As the available reconstructive surgical approaches for articular cartilage repair become increasingly complex, precise animal models to test and to translate new surgical techniques into appropriate clinical treatments are required.